The silver coinage of Miletus in the second century BC has been the subject of much recent study. The issues included here are those of Deppert-Lippitz’s Period V and Period VI (1984: #635–707, #729–765), but her treatment was incomplete and has undergone substantial revision. A large hoard of second-century Milesian silver was discovered in the late 1970s and was dispersed onto the world numismatic market in the 1980s. These coins were initially reported in Coin Hoards VIII (as hoard #474, pp. 55–56), and they have since been the subject of a comprehensive die study by Philip Kinns (1998). That study has been further refined by Kinns through analysis of several new isolated specimens and a putative “1991 hoard,” as well as an additional small hoard acquired in 1965 by the Cabinet de Médailles, Paris, but not previously published (Ashton and Kinns, 2003: 21–26). As a result of these two papers, about 540 new Milesian second-century coins have been described since Deppert-Lippitz’s original work in 1984. I begin here by describing the complex transitional period in the immediate vicinity of 200 BC, and then outline the three phases of second-century Milesian silver recognized by Kinns. The coinage of Miletus in the transitional period surrounding 200 BC is very complex. During the previous half century the city’s silver issues had consisted solely of a long-running series of Persic-standard didrachms. At first (about 260–250 BC) these had been struck in parallel with coins in drachm and hemidrachm denominations, but the smaller coins were soon dropped and from about 250–205 BC the didrachm denomination alone was produced. About 205–200 BC a decision was apparently made to reintroduce silver drachms and hemidrachms (and soon after that to eliminate production of the didrachms). A short-lived and possibly experimental group of silver hemidrachms were initially issued featuring an obverse facing head of Apollo—a type heretofore seen only on the mid-third-century bronze coinage. These new facing-Apollo hemidrachms were struck to a slightly heavier weight standard than the previous silver didrachms: the five well-preserved specimens (of only six known) range in weight from 2.53–2.82 g, “very full for a hemidrachm corresponding to the contemporary didrachms. By contrast twenty weighed hemidrachms of the ‘regular’ group all fall in the range 2.35–2.53 g, while the accompanying drachms do not exceed 5.17 g” (Ashton and Kinns, 2003: 12). The placement of these rare facing-Apollo hemidrachms in the vicinity of 205 BC rests on two lines of evidence. First, the only names recorded on these specimens are ΑΠΟΛΛΟΔΩΡΟΣ and ΜΕΝΑΝΔΡΟΣ, and “one Apollodoros son of Metrophanes was stephanephoros in 206/5, while Menandros son of Thallion held the same office in 203/2” (Ashton and Kinns, 2003: 11). Second, the control monogram on the known examples is ΜΕ, which appears to be a retrograde version of the ΜΕ monogram recorded from a unique profile-Apollo hemidrachm naming one ΒΟΙΗΘΟΣ. 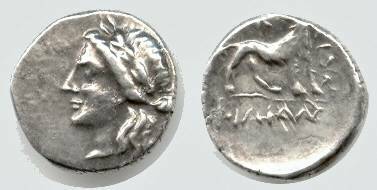 This ΒΟΙΗΘΟΣ hemidrachm belongs to a distinct group of drachms and hemidrachms that stand at the beginning of the main second-century silver series (Kinns’ Phase I), and that constitute—apart from the experimental facing-Apollo silver—the first silver issues in drachm and hemidrachm denominations at Miletus for 50 years. 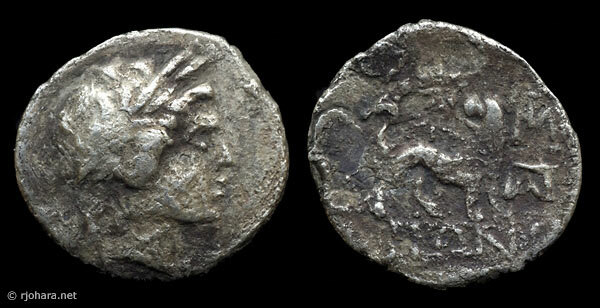 So to summarize the steps of this transitional period: “an initial decision to reintroduce the hemidrachm denomination [about 205 BC, a denomination that had not been issued for 50 years], with a new obverse type and at a higher weight, was for some reason abandoned, in favour of a subsequent return to the profile head [as seen in the drachms and hemidrachms of the “1991 hoard” and their allies]. The pattern was then set for the large issues made through the 2nd century” (Ashton and Kinns, 2003: 12). The main body of second-century silver from Miletus consists almost entirely of drachms and hemidrachms struck to a somewhat reduced Persic standard, along with a small number of Attic-weight tetradrachms. Overall, these issues may divided into three phases (Kinns, 1998; Ashton and Kinns, 2003), with the drachms and hemidrachms of the “1991 hoard” described above representing the beginning of Phase I. Although type directions vary considerably, in general the issues of Phase I have both the obverse and reverse types to the left, while the issues of Phase II and Phase III have types to the right. Phase I: Drachms and hemidrachms with types mostly to left (about 200–170 BC), known from more than 10 obverse and 20 reverse dies naming ΕΧΕΚΡΑΤΗΣ, ΕΠΙΚΟΥΡΟΣ, ΕΠΕΙΚΟΥΡΟΣ, ΕΠΙΚΟΥΡ, ΑΡΤΕΜΙΔΩ, ΛΕΟΝΤΙΣ, ΔΗΜΟΣΘΕΝΗΣ, and ΣΤΡΑΤΟΚΛΗΣ (Kinns, 1998), as well as ΑΥΤΟΚΡΑΤΗΣ, ΒΟΙΗΘΟΣ, ΔΕΙΝΟΣΤΡΑΤΟΣ, ΜΙΝΝΙΩΝ, and ΠΟΣΕΙΔΩΝΙΟΣ (from the “1991 hoard”; Ashton and Kinns, 2003). Phase II: Drachms and hemidrachms with types mostly to right (about 170–150 BC), known from about 40 obverse and 90 reverse dies naming ΣΑΤΥΡΟΣ, ΜΟΛΟΣΣΟΣ, ΔΙΟΓΕΝΗΣ, ΑΥΤΟΜΕΝΗϹ, ΑΥΤΟΜΕΝΗΣ, ΤΥΧΩΝ, ΕΥΒΟΥΛΟΣ, ΔΙΟΝΥΣΙΟΣ, ΕΠΙΚΡΑΤΗΣ, ΥΒΡΙΣΤΟΣ, ΘΕΟΔΩΡΟΣ, ΕΠΙΚΟΥ, ΟΥΛΙΑΔΗΣ, ΣΤΡΑΤΟΚΛΗΣ, ΠΑΙΩΝΙΟΣ, ΒΑΒΩΝ, ΒΙΩΝ, ΑΝΤΙΓΟΝΟΣ, and ΜΑΙΑΝΔΡΙΟΣ (Kinns, 1998; Ashton and Kinns, 2003). Phase II: Attic-weight tetradrachms with types mostly to right (about 170–160 BC). A small group of Attic-weight Apollo/lion tetradrachms were issued alongside the Phase II drachms and hemidrachms. Specimens are known that name the following magistrates (sometimes with two names on the same coin): ΣΑΤΥΡΟΣ, ΜΟΛΟΣΣΟΣ, ΔΙΟΓΕΝΗΣ / ΚΡΑΤΕΡΟΣ, ΔΙΟΓΕΝΗΣ / ΜΕΝΗΣ, ΟΥΛΙΑΔΗΣ, ΥΒΡΙΣΤΟΣ, ΑΠΟΛΛΩΝΙΟΣ / ΣΤΡΑΤΟΚΛΕΙΟΥΣ, ΜΟΛΟΣΣΟΣ / ΜΕΝΗΣ, ΕΠΙΚΟΥΡΟΣ, ΕΠΙΚΟΥΡΟΣ / ΑΡΤΕΜΙΔΩΡΟΣ, ΕΠΙΚΡΑΤΗΣ / ΚΡΑΤΕΡΟΣ, ΜΟΛΟΣΣΟΣ / ΚΡΑΤΕΡΟΣ, ΟΥΛΙΑΔΗΣ / ΚΡΑΤΕΡΟΣ, ΕΠΙΚΡΑΤΗΣ / ΑΡΤΕΜΙΔΩΡΟΣ, and ΟΥΛΙΑΔΗΣ / ΑΡΤΕΜΙΔΩΡΟΣ (Herbert, 1979: #326, listed wrongly as AE rather than AR, and certainly from the same dies as D-L #765; Deppert-Lippitz, 1984: #752–765; Kinns, 1998: 177–178; Ashton and Kinns, 2003: 25–26, pl. 5W–Z; see also CNG’s Triton X sale, 9–10 January 2007, #300, a specimen naming ΟΥΛΙΑΔΗΣ from D-L dies V2/R6). Phase III: Drachms and hemidrachms with types mostly to right (about 150–115 BC), known from more than 40 obverse and 70 reverse dies naming ΔΙΟΓΕΝΗΣ, ΒΙΩΝ, ΦΙΛΙΔΑΣ, ΥΒΡΙΣΤΟΣ, ΜΑΙΑΝΔΡΙΟΣ, ΜΕΛΑΝΘΙΟΣ, ΜΕΛΑΝΘΙΟϹ, and ΕΥΜΑΧΟ[Σ] (Kinns, 1998; Ashton and Kinns, 2003). “Although four of the seven names…and five of the 19 different controls…are familiar from Phase II, the structure of the Phase III issues is quite distinct. The relative production of the two denominations, with a greater emphasis on hemidrachms, the many die-links between different magistrates and controls, the absence of any connexions with the Attic weight tetradrachms, and the lack of consistency in type direction, together present a marked contrast to what has gone before. We may particularly note the hemidrachms of ΒΙΩΝ ΜΟΙ (nos. 219–29, 477), which include die-combinations showing both types left, both types right, Apollo left/lion right and Apollo right/lion left, a phenomenon not seen previously” (Kinns, 1998: 180). The drachms and hemidrachms of Phase III are the last “Greek” silver coins of Miletus. In 133 BC the city formally became a part of the province of Asia under the control of Rome. (1a) A second-century quarter-drachm. 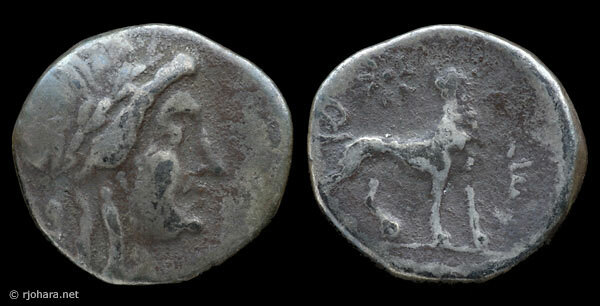 A unique Milesian quarter-drachm specimen naming ΣΤΡΑΤΟΚΛΗΣ has recently been described by Kinns, and dated to about 180–170 BC (his Phase I). The specimen weighs 1.05 g, but it is chipped; the expected weight of a quarter-drachm from this period is about 1.25 g. This coin “represents the smallest silver denomination struck by Miletus after the 5th century. 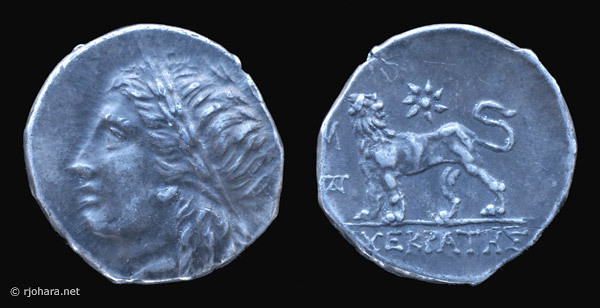 It takes its place alongside silver fractions from Erythrae, Magnesia, Teos, Chios, and Samos, belonging to the same general period (c. 200–150), but otherwise the issue of such coins in Ionia at least had for the most part long been abandoned in favour of token bronze” (Ashton and Kinns, 2003: 24–25, pl. 5U). (1b) Gold staters of Miletus. A rare second-century Milesian issue of Attic-standard gold staters (about 8.6 g) is known from five specimens (e.g. Sear, 1979: #4510 = BMC #113), with magistrate names ΒΙΩΝ and ΕΥΜΗΧΑΝΟΣ. Deppert-Lippitz believed these were forgeries (1984: 121–123, pl. 32.1–2, 32.4–6), but Kinns has demonstrated that they are genuine (1986: 245–247; 1998: 182–183). One ΒΙΩΝ specimen (D-L pl. 32.1 = BMC #112) features an obverse three-quarter facing head of Apollo to right, with a reverse lion statant regardant to right on an exergue line, and is entirely unique; Kinns dates it to about 170–160 BC (1998: 183; his Phase II, above). The remaining four specimens, one ΒΙΩΝ ΜΟΙ and three ΕΥΜΗΧΑΝΟΣ, all with profile-Apollo and lion to right, he dates to after 150 BC (his Phase III). No examples of these rare types are included in this collection, but the beautiful ΕΥΜΗΧΑΝΟΣ profile-Apollo specimen owned by the American Numismatic Society is available for viewing online. Jenkins (1972: 280, 284–285, #688–689) describes the obverse of the ΒΙΩΝ ΜΟΙ profile specimen as depicting the head of Artemis rather than Apollo, but this seems to be a simple error. He cites the 1959 printing of Barclay Head’s Principal Coins of the Greeks (plate 44.11) as his source, but the 1965 printing of Head’s work, the only one I have seen, describes the ΒΙΩΝ ΜΟΙ profile specimen as depicting an obverse “Head of Apollo; bow and quiver at shoulder” (1965: 80, pl. 44.11). Jenkins’ apparent error is repeated by Gorman (2001: 172). The silver coinage of second-century Miletus is divided into three phases, as described above. Five hemidrachms, representing all three phases, are included in this collection. Kinns initially dated the coinage of Phase I to about 200–190 BC (1998: 176–177), but he has since revised that opinion, suggesting that there may be “after all no appreciable interval between Phases I and II” (Ashton and Kinns, 2003: 23–24). RJO 72. Silver hemidrachm (2.51 g), about 217 BC. Obverse: laureate head of Apollo left. Reverse: lion standing left on exergue line, looking back at seven-pointed sun; ΜΙ monogram over ΑΠ(?) monogram to left; magistrate’s name [Ε]ΧΕΚΡΑΤΗΣ in exergue. This specimen is certainly from the putative “1991 hoard” described above, and it shares an obverse die (as well as a distinctive patination) with the hemidrachms of ΒΟΙΗΘΟΣ, ΔΕΙΝΟΣΤΡΑΤΟΣ, ΜΙΝΝΙΩΝ, and ΠΟΣΕΙΔΩΝΙΟΣ described by Kinns (Ashton and Kinns, 2003: 10–11, pl. 2O-P; die V15 of Deppert-Lippitz, 1984: #650, magistrate ΔΕΙΝΟΣΤΡΑΤΟΣ). Only two other hemidrachms naming ΕΧΕΚΡΑΤΗΣ have been recorded: SNG von Aulock III: #7934 (not seen; = Deppert-Lippitz, 1984: #649, not illustrated), and the specimen described by Kinns from Coin Hoards 8 , 474 (Kinns, 1998: 183, pl. 38, badly worn). In a footnote, Kinns reports having seen hemidrachms of ΔΕΙΝΟΣΤΡΑΤΟΣ, ΕΧΕΚΡΑΤΗΣ, and ΜΙΝΝΙΩΝ on the London market in 1991 (Ashton and Kinns, 2003: 10, n. 39); it is possible that this specimen was among that group. Kinns dates the Phase II drachms and hemidrachms to about 170–150 BC on the basis of the related Attic-weight tetradrachms, which were struck in parallel with the early Phase II drachms and hemidrachms and which have been dated with some confidence to about 170–160 BC (Kinns, 1998: 180; Ashton and Kinns, 2003: 25–26). RJO 4. Silver hemidrachm (2.47 g), about 170–150 BC. Obverse: laureate head of Apollo right. Reverse: lion standing right, looking back at eight-pointed sun; ΜΙ monogram (barely visible under magnification) and Ε monogram to right of lion. This coin appears to be a die duplicate of either #74 or #75 described by Kinns from Coin Hoards 8 , 474 (1998: 185, pl. 39), minted from obverse die O23 and either reverse die R32 or R33. The magistrate of this issue is ΑΥΤΟΜΕΝΗΣ, but the name is not visible on this specimen. Compare also Deppert-Lippitz (1984: #738, pl. 25), who describes only one ΑΥΤΟΜΕΝΗΣ example in this denomination. The distinctive patination and pattern of wear seen on this specimen appears to be identical with D-L #738, and also with Kayhan #504 (Konuk, 2002), which looks very much like it was struck from Kinns’ O23, even though the reverse magistrate of Kayhan #504 is said to be ΒΙΩΝ (a combination not recorded by Kinns). Kinns dates the issues of Phase III to about 150–115 BC, but with qualifications: “[i]n fact it is difficult to believe that the [Phase III] Milesian issues, using 16 obverses for drachms and 31 obverses for hemidrachms, in a series that looks continuous and involved so few magistrates, was struck over a time span as long as 35 years; 10–15 years would seem more than adequate” (1998: 182). Given that Miletus fell under Roman control in 131 BC, it may be that that date marks the end of the Phase III coinage. RJO 93. Silver hemidrachm (2.44 g), about 150–115 BC. Obverse: laureate head of Apollo left. Reverse: lion standing right on weak exergue line, looking back at sun; ΜΟΙ vertically at right; expected ΜΙ monogram off the flan at right; magistrate’s name ΦΙΛΙΔΑΣ in exergue. This coin was struck from obverse die O66 described by Kinns from Coin Hoards 8 , 474 (1998: 188, pl. 43); the reverse die is similar to all the ΦΙΛΙΔΑΣ dies Kinns illustrates (R115–119) but it does not appear to be an exact match for any of them unless some recutting was involved. RJO 44. Silver hemidrachm (2.50 g), about 150–115 BC. Obverse: laureate head of Apollo right. Reverse: lion standing right, looking back at sun; ΜΙ monogram and complex ΑΠ(?) monogram to right of lion; magistrate’s name ΒΙΩΝ in exergue. This coin is a die duplicate of #370 described by Kinns from Coin Hoards 8 , 474 (1998: 190, pl. 45), minted from obverse die O86 and reverse die R158 toward the end of Kinns’ Phase III. The Apollo of O86 has a notably beady eye. RJO 98. Silver hemidrachm (2.36 g), about 150–115 BC. Obverse: laureate head of Apollo right. Reverse: lion standing right, looking back at sun; ΜΙ monogram to right and ΑΠ vertically to right of lion; magistrate’s name ΒΙΩΝ in exergue. This coin was struck from obverse die O86 and reverse die R168 described by Kinns from Coin Hoards 8 , 474 (1998: 190, 195, pl. 45), toward the end of his Phase III. The beady eye of the Apollo of O86 is again apparent.